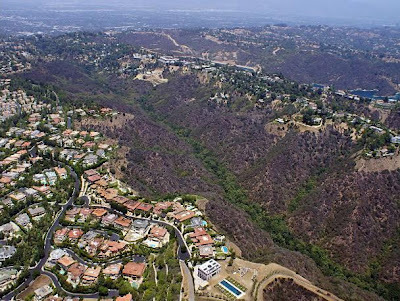 While not exactly celebrity related, it's certainly intriguing that a 258-acre tract of undeveloped land in the swanky Bel Air area of Los Angeles has come up for sale with a sky high $125 million price tag, as was first reported this week by the kids at Curbed. As best as Your Mama can tell from our brief and entirely unscientific research, the vast tract comprises two large parcels owned by the Beverly Hills-based Giro Properties who picked up both properties in at the same time late 2006 for and unknown amount of dough. Curbed calculated the two parcels represent a staggering 6% of the total of land in all of Bel Air and, according to the Los Angeles County Tax Man, the two parcels have a combined assessed value of $25,562,621with property taxes that rang up to more than $325,000 for 2012. Both of parcels are mostly made up of steep and difficult to access chaparral covered hillside that could make development difficult. Plus, any houses (or whatever) that gets built on the property will most likely be in full view of the homes along the ridge lines that flank the rugged canyon property. Indeed, in case anyone cares, the property is overlooked by the $9 million mock-Med macmansion in the guard-gated Bel Air Crest community that new mommy Kimmie Kardashian bought in January (2013). I wouldn't call it undeveloped land. It's a ravine, picturesque scenery, call it what you will, but it's not building lots for anyone with a lick of sense. They want $125 million for a giant ditch, lmao. No views, no privacy, and no hope of winning the neighbors approval. I have no idea if it is easily feasible, but given the price of major estates in Bel Air, anyone wanting beauty and privacy, not to mention the most unique asset, could buy this and erect whatever single estate they want with the result being the most exceptional estate in Southern California. that big brown ditch is "picturesque"??? You idiots have no vision. It may not be worth $125 million, but it is worth a lot. Look at those other houses, how packed onto each other they are. I would take this land, make huge lots out of them and sell them for huge money. Hell, you could develop one side and leave the other bare so that people could have some privacy and not views of other houses or people staring into their backyards. As packed as out there is, people would pay huge money for that kind of privacy and views. Owned by real estate syndicator, Eri Kroh, I believe. There are only hillside views. It's smashed between upper bel air and bel air crest. And you can bet $125million both of those neighborhoods will harshly oppose the altering of their views. Not to mention all the money needed just to access this dumb plot. Two gated communities (Moraga and Bel Air Crest) prevent reasonable roads from being laid.